Different breeds of chickens are found all over the world, including the Ancona from Italy, the Cornish from England and the Rhode Island red from Massachusetts and Rhode Island. Although different breeds vary in their appearance, most rooster species all have one thing in common: hanging skin under their necks. 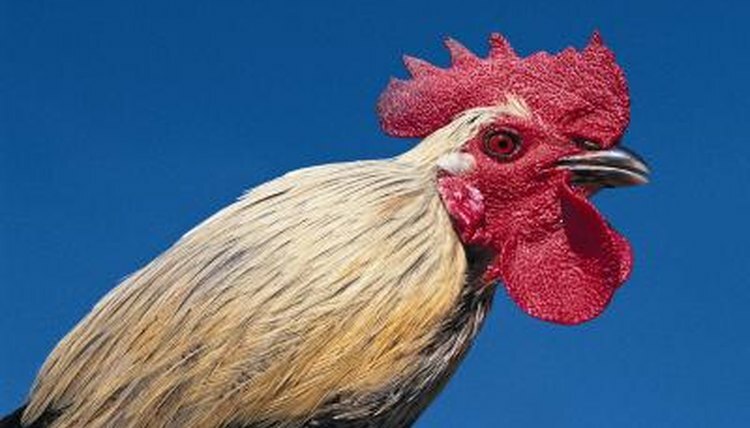 The skin hanging underneath a rooster's neck is known as the wattle. Wattles are the same color as the fleshy skin, or comb, on a rooster's head. The shape and size of the wattle varies depending on the breed. A healthy wattle is soft, blemish-free and deep red, which indicates good blood flow. If castrated, a rooster's wattle ceases to grow. Hens also have wattles, but they are smaller than a rooster's wattle. A rooster's wattle and comb serve the same purpose. Roosters use their wattle to attract potential mates. Hens commonly ignore roosters whose wattle is too small, as healthy roosters have large and bright wattles. Wattles are also important for controlling a rooster's body temperature, as the wattle has a healthy blood supply. During the summer, blood traveling through the wattle cools down before traveling to the rest of the body. Any change in color or shape of a rooster's wattle requires immediate veterinary attention, as this is a sign of poor health.